Physical challenges of any kind are difficult undertakings. Triathlons are no exception to this. Most people spend months training to ensure that they will be able to compete successfully. If you are planning to race in a triathlon, it is important that you know how to maintain a strong mental game before, during, and after the race. When our bodies are tired, our brains naturally begin thinking about how fatigued we are. During training, practice shifting your thoughts away from exhaustion and to technical aspects. Focus on your swimming technique while you are swimming or on your position on the bike while riding. If you can master this skill during training, you are more likely to be able to use this trick during the race when you inevitably begin to grow tired. Being able to turn your thoughts away from your physical pain will improve your performance. It is common for athletes to be nervous before taking on a race like a triathlon. If you begin to doubt your ability before the race, review your training log and notes. Remind yourself that you have worked hard for this and that your body can complete the event. Going into the race feeling confident and prepared is key for success. There is most likely a segment of the race that you are especially nervous about, either because you struggled with it in training or because you know it will be the most difficult. To keep these anxieties from affecting your performance, make a list of the things that stress you. After listing them, make another list that outlines how you can overcome those obstacles. 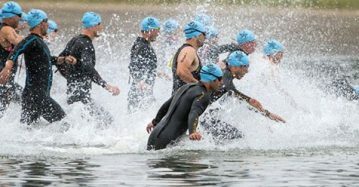 Because of the large number of people who generally take part in triathlons, there will be a lot going on around you. Try to focus on yourself. Do your best to ignore what others are doing and think only about your plan and your strategy. Allowing other competitors to distract you will hinder your ability. When you start to get fatigued, you need to do your best to stay positive. Your brain will begin to grow negative and self-deprecating, planting seeds of doubt in your mind. Fight these negative thoughts by thinking about how proud you are of yourself for doing this or that the pain is only temporary. Thinking about the race in its entirety can be extremely daunting. Break your goals into smaller segments. Focus on the activity that you are doing at that moment, because thinking about how much longer you still must go is detrimental to your mental toughness and will decrease your overall motivation. Working with a professional coach is extremely helpful for triathlons. You will need advice and guidance about how to train effectively and what the best ways to achieve success are. Professional coaches can also help you set goals that will challenge you while remaining attainable. F3 Fitness offers people help getting into shape and preparing for events like triathlons. Contact F3 Fitness for more information on triathlons and how to best tackle a physical challenge such as this.